Pour water in saucepan and sprinkle with gelatin. Allow to soak for a minute or two. Heat over low heat, stirring constantly, until gelatin is fully dissolved (about 5 minutes). Stir in the sweetened condensed milk. Remove from heat, and add the vodka and liqueurs, stirring to fully incorporate. Pour into prepared molds (should be sprayed with cooking spray to help not stick). Chill for hours. Remove from molds. Pour chocolate shell (about 1/2 tsp for each one) over the shots and put into freezer for 20 seconds to set up. Top with whipped cream and cherries. Even though it’s only spring… summer is just around the corner. And summer means ice cream!!! Growing up when we went to get ice cream we were allowed two scoops OR a banana split. This should be a no brainer to most. Banana split! So why not get a jump on summer with boozy Banana Split Jelly Shots. 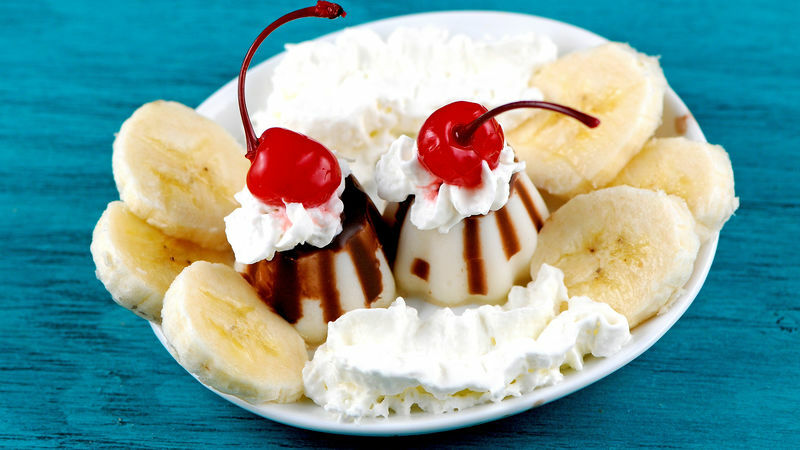 Everyone loves banana splits… ice cream (dairy), chocolate (more dairy), whipped cream (more dairy), bananas and cherries (fruit) with all of that in there it’s practically a health food! And all that you love in a banana split into jelly form with one heck of a kick. Banana liqueur, cherry vodka, and white chocolate liquor all topped with chocolate, whipped cream, and of course a cherry on top. Make these and you might just give the ice cream man a run for his money. Pour magic chocolate shell (about 1/2 tsp. for each one) over the shots and put into freezer for 20 seconds to set up. Top with whipped cream and cherries. Enjoy!